There are 24 other images of this object. See our image rights statement. See more objects with the color silver rosybrown tan black darkolivegreen or see all the colors for this object. This is a Salesman's sample book. We acquired it in 1950. 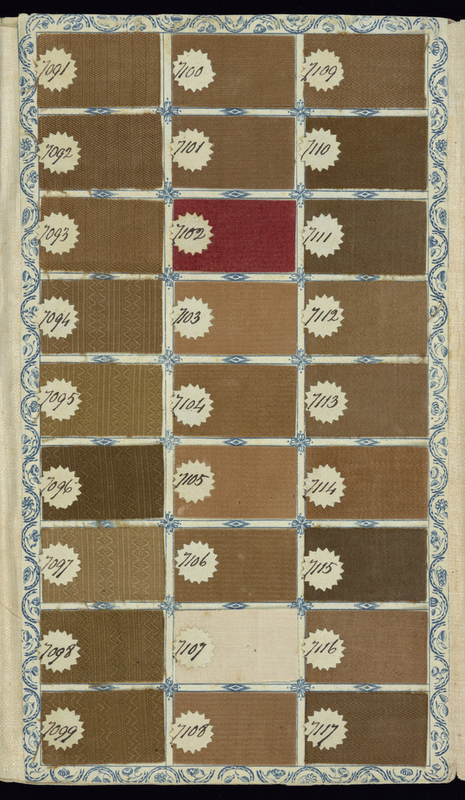 Its medium is marbleized paper, cardboard, cotton, linen and its technique is plain weave, twill weaves, float weaves (damask), supplementary weft pile (velveteen); 108 examples are block-printed. It is a part of the Textiles department. This object was purchased from Charles Grand and catalogued by Gillian Moss.